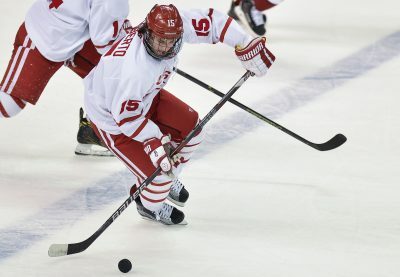 Back in the summer of 2013, a nine-member freshman class enrolled at Boston University, hoping to leave a lasting legacy on the men’s hockey team. Now, nearly 40 months after their first game, three remain as seniors, and their careers on Commonwealth Avenue are slowly winding down. The trio – defenseman and captain Doyle Somerby and forwards Tommy Kelley and Nick Roberto – also kicked off their careers in head coach David Quinn’s first year at the helm of the Terriers. From that, Quinn had high praise for the trio ahead of their Senior Night, which will take place on Saturday when BU hosts Notre Dame at Agganis Arena. Across their four years, Kelley, Roberto and Somerby have amassed almost 335 NCAA games and 80 points. They’re all local kids, too, hailing from Natick, Wakefield and Marblehead, respectively. They also grew up playing together – Somerby and Roberto went to Kimball Union Academy together, for one – so their bond extends beyond four years of throwing on the scarlet and white jersey. For Roberto, many of the same emotions rang true. Somerby added that Senior Night will be special, especially after the countless highs and lows of his hockey career. Those ebbs and flows particularly resonate during their time at BU. As freshmen in 2013-14, Kelley, Roberto and Somerby were part of a squad that went 11-21-4. They played in a combined 99 games that season, but were often left with an unfamiliar feeling: Losing. Then came a dream run during their sophomore season in 2014-15, the year Jack Eichel laced ‘em up for the Terriers. They marched to the national title game against Providence College, winning the Beanpot Tournament, Hockey East regular-season title and Hockey East Tournament along the way. Roberto and Kelley hailed that group’s atmosphere in and around Agganis Arena. Somerby, however, pointed to another reason for BU’s success: An extended offseason after a rough freshman campaign. Their junior season was then somewhere in between, with the Terriers posting a 21-13-5 record and falling in the first round of the NCAA Tournament. And now as seniors in 2016-17, the trio has been thrust into leadership roles, guiding what’s the youngest team in college hockey. For sophomore forward Bobo Carpenter, their experience and example has paid major dividends. All things considered, Kelley, Roberto and Somerby have experienced a winding journey throughout their time at BU. As mentioned, they’re the last ones standing – Robbie Baillargeon, T.J. Ryan, Dalton MacAfee, Dillon Lawrence, Brendan Collier and Kevin Duane have all moved on from the program – and now want to end their BU careers with a bang. As for the future? Roberto and Kelley said they’re not entirely sure what’s in store for them, while Somerby, a draft pick of the New York Islanders, plans on graduating this May then discussing a professional career with New York’s front office. In the interim, though, Somerby said the time for broad reflection can wait. As he put it, there’s an NCAA title to go win.